In a filing to Bursa Malaysia yesterday, Astral said the 599.41ha leasehold project would comprise a commercial centre, an industrial centre, a mixed residential designs, public amenities and infrastructure. Astral said the project incorporated a high-tech park to be named - Kuantan Hi-Tech Park. AXIS-REAL Estate Investment Trust Managers Bhd (Axis-REIT) has become the third listed company and the first real estate investment trust (REIT) to offer the option of new units in the REIT as dividend payment. In an announcement to Bursa Malaysia yesterday, the company said it will seek unitholders' approval to offer a reinvestment plan, giving unitholders the option of a cash payout, new units or a combination of cash and new units (electable portion). It proposes to issue new units of up to 20 per cent of the current fund size of Axis-REIT of 375.9 million units. This comes after Malayan Banking Bhd and AMMB Holdings Bhd announced similar plans last year. Maybank's reinvestment plan was dubbed a success, enticing some 80 per cent of shareholders to reinvest in the financial institution, while AMMB's plan is yet to be issued. Axis-REIT shares fell 0.01 sen yesterday to close at RM2.40. Bloomberg Consensus shows that eight of research firms have a "buy" call on the stock, while four recommend a "hold". Its average target price is RM2.60. "Placements are restricted to a pool of investors, and we don't do rights issues because it's dilutive in nature, so the reinvestment plan seems (to be) a very fair way of distributing units to our investors," Axis-REIT Managers Bhd chief executive officer Stewart LaBrooy told Business Times yesterday. The cash secured from the reinvestment plan will help bolster the REIT's borrowings-to-total assets ratio, which could breach 35 per cent, in view of future acquisition plans. While there is no rule to specify it, syariah-compliant REITs' debt-to-asset ratio has generally hovered between 30 and 35 per cent. The total amount of income distribution to be declared, the size of the electable portion and consequently, the maximum number of new units to be issued under the proposed income distribution reinvestment plan would depend on the financial performance and cash flow position of Axis-REIT, and prevailing economic conditions. 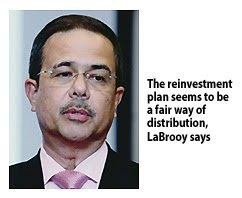 "It's a much easier, nicely well- managed way to manage our debt- to-asset ratio," LaBrooy said. The exercise will also help make the stock more tradeable. While the issue price of the new units has a 10 per cent discount cap to the average market price prior to the price-fixing date, Axis-REIT has traditionally accorded discounts of between 4 and 5 per cent.